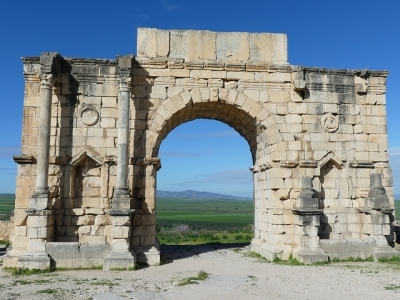 The Archaeological Site of Volubilis encompasses the remains of a Roman city that was capital of 'Mauritania Tingitana'. 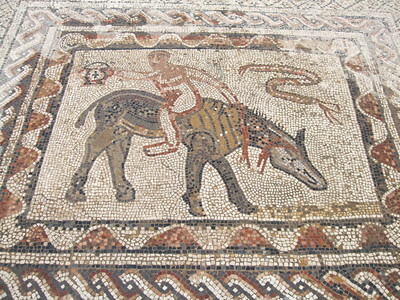 It is notable for its high number of mosaic floors. Also, marble and bronze statues have been found. The site was settled already in the 3rd century BC, before it was annexed by the Romans in about 40 AD. It has a favourable location, due to fertile grounds, for the cultivation of olives. At its heyday, the city probably had 20.000 inhabitants. Most of its large monuments such as the triumphal arch and capitol date from the 2nd and 3rd century AD. In 2008, the buffer zone of this WHS was extended to include the surrounding plain and mountains and the pilgrimage town of Moulay Idriss. The saint Idriss I had made Volubilis his home before founding Fez and Moulay Idriss. 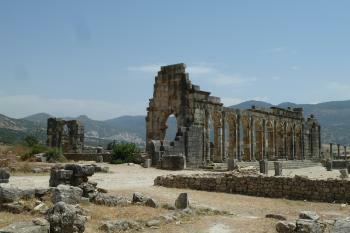 Volubilis has all the works of an ancient Roman city: forum, triumphal arch, capitol, basilica, baths, private houses. Only about half of the site has been excavated. A theatre has not been found yet, but it must be somewhere. At least that is what I heard from a loudmouthed German guide that commanded his group like a visiting troop. The site is very popular with tour groups in general, but it is large enough to take them in. The two best things about Volubilis are its setting and its mosaics. The ruins lie on a fertile plain that is still used for growing olive trees. Come to think of it - the area could have been enlisted as a cultural landscape, especially because the nomination file elaborately points out the site's history before and after the Romans ("from prehistory continuously through to the Islamic period"). The neighbouring pilgrimage town of Moulay Idriss is on the Tentative List and directly connected to Volubilis too. Lots of the mosaics are in pretty bad repair. They are out in the open air and tormented by the elements day after day (scorching heat, heavy rains). Often they are 'just' patterns that cover the floor of a private house. Some more artistic ones display the Labours of Hercules and an athlete jumping on a horse. Entrance to the site is 10 dirham. A visit will take about 1.5-2 hours. There's no public transport directly to Volubilis, but Grand Taxi's will find you either in Meknes (33km) or Moulay Idriss (3km). I visited this WHS in March 2018. Since the site opens at 08:30 and the morning light is best for photography of the main features and mosaics, I decided to start my day trip early with Volubilis first, Moulay Idriss next and Meknes afterwards. This is a very easy and enjoyable day trip. Even though the sites may not be the very best on the list, together they make one of the best day trips I ever did. Volubilis is a partly excavated Roman city which is commonly considered also as the ancient capital of the Roman-Berber kingdom of Mauretania. It has all the features and ruins you'd expect in a Roman city and exterior mosaics still in place without any means of protection except a few ropes to prevent tour groups from stepping on the tesserae. The absolute plus point is the beautiful natural setting which the site still enjoys except from the neatly perched town of Moulay Idriss some 3km away. Arriving by car from Fes, I already saw a road sign displaying Volubilis' inscription on the WH list from some 18km away. There is a marble UNESCO inscription plaque too immediately after the ticket booth where you pay your 10 dirhams for an entrance ticket. There is a small (but ugly!) concrete 'interpretation centre' with a few information boards, capitols, columns, tools, remains and a couple of splendid mosaic fragments. It's amazing to be able to see hints of the beauty of an ancient Roman city in ruins juxtaposed with the ability of modern man to build ugly structures which will clearly not withstand the elements over time! When approaching the site by car you'll pass by the Tangier Gate but the parking lot and ticket booth are situated towards the southern section. As I walked anticlockwise from the southern section, I headed straight towards the Tangier Gate. From here I could really appreciate the outstanding and impressive view not only of the gate but also of the whole Roman outpost. Passing through the gate, I walked down the Decumanus Maximus which is the most prestigious thoroughfare in the city linking the Tangier Gate with one of the highlights of Volubilis, the Arch of Caracalla or Triumphal Arch (photo), erected in AD 217. The porticoes lead to the adjoining houses on both sides of the road with some exquisite mosaics especially in the House of Venus, the House of the Rider and the House of the Acrobat. What remains of the basilica are a series of arches and columns where several storks have built their nests. Even if you take lots of photos and take your time to take in the surroundings, it would be rather difficult to spend more than 3 hours here so do combine it with at least a short visit of Moulay Idriss Zerhoun. Considering how far they are from Rome, these ancient Roman ruins are really impressive and it must have been quite a grand outpost they had here in Morocco. It's a bit out of the way to get to but not too far if you are visiting Meknes anyway. Also, the nearby town of Moulay Idriss is really nice too. I stayed there overnight and walked to Volubilis. It's not a short hike but it's easy enough to walk there and back. When you go through the entrance to Volubilis, there will be guys there offering to guide you. I'm sure they would do a good job and you could negotiate a price but I just wandered around and saw it myself. Perhaps I would have learned more from them but I enjoyed getting a sense of the place just by looking. Volubilis was a nice site which gave a good impression of everyday life in a Roman outpost; however my main recollection of it is of the incredible heat during our visit. We could see the ruins from some way back as our taxi wound its way to the site which was once one of the remotest outposts of the Roman Empire. Once there you could get a real feel for the lay out of the town, and he functions of different districts, including the rebuilt olive presses in the former industrial areas. The former houses are decorated with some mosaics, several are impressive, though I have the feeling they aren't coping too well with being consistently exposed to the bright sunlight as the colours are looking rather muted. It did give a good idea of what life in a Roman town was like. After hiding in the shade of the larger ruins at the capitol we headed back to our taxi, stopping to dowse ourselves in water and view the promising looking new visitor's centre which seemed to be nearing completion. We stopped to get some more drinks at the shabby old restaurant and I must admit my heart went out to the staff there. They were sprawled on the floor trying to make it through their Ramadan fast in the astonishing heat; I would have felt even guiltier about drinking their soft drinks if I wasn't feeling so unwell myself from the heat. All in, we got through 3 litres of fluids each during our brief visit. I couldn't have felt further away from my previous visit to a Roman outpost on a damp drizzly hike along Hadrian's Wall, which I guess really illustrates how big the realm once was. We headed off in our taxi to nearby Moulay Idriss where it had cooled down to a nippy 47*C and the cool shaded alleys offered somewhere to cool off from the dizzying onset of potential heatstroke. I enjoyed my trip to this former Roman outpost, and it was pretty easy to get an idea of what life would have been like there. A combined trip to Volubilis and Moulay Idriss by either a shared or chartered taxi it is a worthwhile day trip from Meknes or even Fez. If you do visit at the height of summer though remember to take vast quantities of fluids. 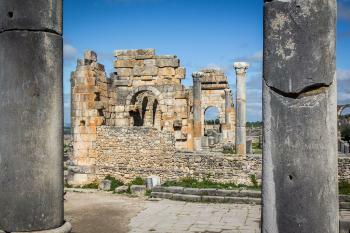 Although much of much of Morocco is arid, Volubilis is located in a verdant landscape. I am sure that the city was put here because they could grow crops to sustain themselves. There are many mosaics made of black and white stones still in situ in the ruins. A rarity in this day when everything is moved to a museum. The remains of streets and houses is most interesting. There is also a magnificent marble memorial arch on the main street. It looks like the one shown in the movie 'Patton'. Tumuli: AB: "there is a burial mound dating from the 3rd/2nd century BC"
Walled cities: AB: ?the ancient town is well defined by the remains of its walls, stretching for 2.35 km and visible for most of that length? Built in the 1st century: Although it was capital of the Mauritanian Kingdom from 300BC during which it was "laid out on the Punic-Hellenistic model" (AB) Volubilis is inscribed "as an exceptionally well preserved large Roman town" " an aspect which only commenced when Rome annexed the area in 40AD. At this point it .. Rapidly expanded to its maximum extent" (AB) although its Roman walls and monumental centre date to 168-9. In 285 the Romans abandoned the area. Reduced from broader TWHS: TWHS originally included Moulay Idriss Zerhoun which is now a separate TWHS.